Hello lovelies!! It is important to use a face pack at least 2-3 times a week to revitalise the skin, remove impurities and get a healthy and natural glow. Owing to my hectic schedule I am able to use a face pack only 1-2 times a week. 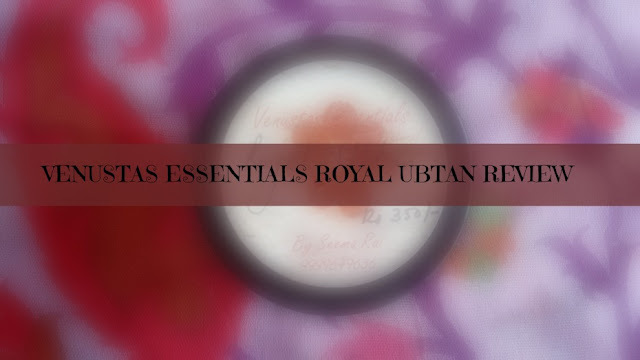 The face pack that I am going to review today is handcrafted painstakingly at the house of Venustas Essentials and goes by the name of Royal Ubtan. The beauty benefits of Ubtans are well known from the ancient times. Ubtan is one of century’s old natural product that is passing from generation to generation and still in use for ultimate beautification. This Royal pack/ Ubtan is a unique blend of Kesar, badam - rich in Vit E and many more ayurvedic herbs and essential Oils. This pack deeply nourishes the skin, reduces the blemishes and gives your skin an ageless healthy glow. Have a wedding to attend? Now say bye to expensive beauty treatments and facials. Get that perfect glow at home and see the heads turn at the radiant you. Ingredients: Saffron, almonds, rose petals, sandalwood extracts, milk extracts, clay mix, rose EO and sandalwood. Packaging: It comes in a transparent plastic jar with an inner lid to further protect the content and a black screw lid which shuts tight. The label mentions brand name, product name and price however the details like shelf life, ingredients and date of mfg are missing. I am a very lazy person and more so due to my hectic schedule because my only breather are Sundays!! I don't really like to make an effort when it comes to preparing face packs which require mixing and stuff. When I stumbled upon Royal Ubtan Face Pack on the brand's page and thought it was a pre-mixed pack which would require me to simply apply the pack on my face I jumped at the idea and purchased the product. But upon opening the jar I was greeted by a face pack with a powdery texture. I was heartbroken because it required lazy me to do all the mixing :( But when I used the face pack, it was all WORTH IT. My skin had a natural glow and the complexion was brightened. VE Royal Ubtan is brown in colour and comes in powder form and doesn't have a distinguishable fragrance. 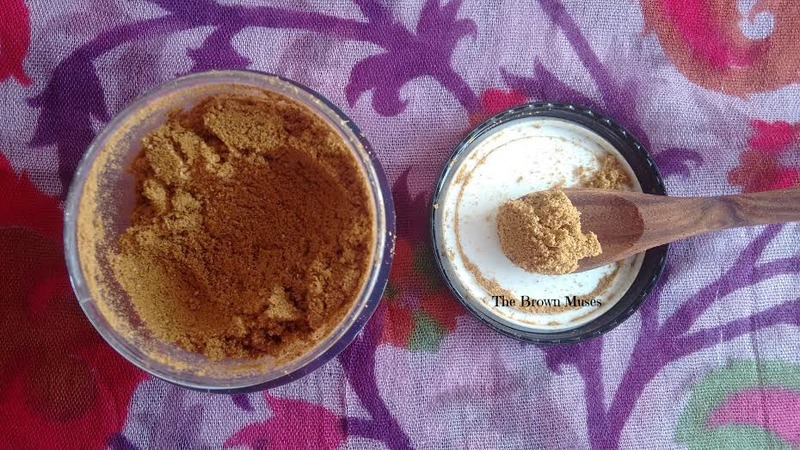 To use, I take required quantity in a plastic bowl (always make sure that a clean and dry spoon is used to scoop out the product in order to avoid contamination) and create a slightly runny paste with rose water. I apply the face pack after washing and exfoliating my face with a handmade cleanser and face scrub from different brands respectively. I leave the face pack on for about 10 minutes and rinse it while exfoliating with it very very gently with tepid water. The pack indeed renders a very nice glow which lasts at least for a day! If you are heading to a party and do not have time to visit a salon for a facial this face pack could be your saviour. The pack also removes impurities from the pores and causes no irritation, dryness and redness. The product also claims to reduce blemishes other than nourishing and lending a glow to the skin but since I don't have any I cannot comment on the claim! The face pack indeed feels very royal because it contains a luxurious blend of almonds, saffron, sandalwood, rose EO etc. which are responsible for lending the skin a nice healthy glow and brightened complexion! To conclude, VE Royal Ubtan is a great face pack which nourishes, softens the skin. It contains natural ingredients but a patch test is still recommended. Contains a luxurious blend of almonds, sandalwood, saffron etc. Lends a nice and healthy glow to the skin and brightens up the complexion. The skin feels soft and smooth post use. Fulfills nearly all the claims it makes. Doesn't dry or irritate the skin. I noticed no redness either. Availability - Not a con for me though! Wish the glow would last longer. Wish the brand provided a wooden spoon/spatula or something.